Will relieve legume (alfalfa, clover) bloat in cattle within minutes when used as directed. 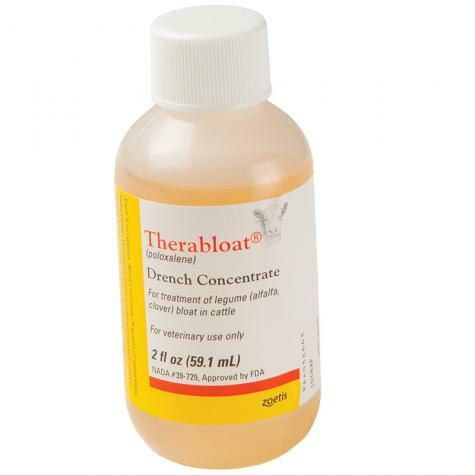 For best results administer at the earliest sign of bloat. If bloat has progressed in its severity to the degree that the animal is down, other means of treatment are also recommended (rumenotomy-rumen puncture). 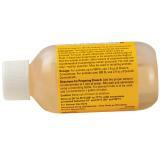 Cattle Dosage: For animals up to 500 lb use 1 fl oz. For animals over 500 lb use 2 fl oz. May be used in lactating animals. Directions for preparing drench: Add the proper amount of concentrate to 1 pint of water. Mix well and administer using a drenching bottle. If a stomach tube is to be used, add concentrate to 1 gallon of water. Store at 20º to 25ºC (68º to 77ºF), with excursions permitted between 15º and 37ºC (59º and 99ºF). Read all warnings and cautions on label. For oral use only. Restricted drug in California. Keep out of reach of children. For livestock use only.